In ultimate Frisbee people get really healthy from playing it, the game is fast paces and really exciting. You want to know why and how? 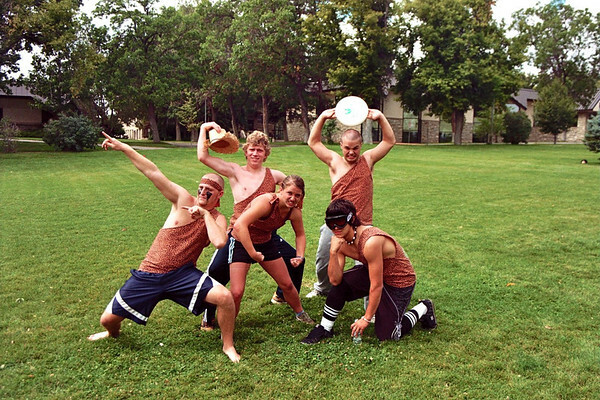 Well read on to find out why ultimate Frisbee is so famous and healthy. Being healthy consists in three different types, the emotional health, social health, and physical health. In ultimate there are no referees, that means the players have to solve matters in their own way. This helps the social health, by settling the problem, you can feel really good for talking with your friend or opponent about something that others you in the game. In the game you need to run, throw and maybe even dive, this helps you in the physical health if you are participating in the game, and if you score, it can feel really good. In this game it builds teamwork if you pass to someone. As I was saying, passing is really important, this helps your emotional health, to feel that someone is giving you the opportunity to run up and score or to pass it down to your friend to even the odds of the game. Try ultimate Frisbee, it’ll do you good! You can then have a enjoyable life, make more friends and become more athletic. Do you want that? Well duh! I learned a lot about the facts of how the hormones and cells work. Like how they are like keys and locks, they must recognize each other to have an effect. For example a certain hormone can only affect a specific cell to have an effect. What I learned from Myna and Phoenix is how to use them so they can be useful in the future for creating posters or making audios for other people. My winter holiday would be epic for sure and I’m looking forward to it. (Like everyone else) I’ll go back to Taiwan and have a enjoyable time because I know that my cousins also have a break and can accompany me. We’ll do our usual thing, play on XBOX 360 and computers and eat out in restaurants that have awesome foods. Or if we are too busy playing games I’ll take money and go to 7-ELEVEN to buy foods like noodles, rice curry, beef or whatsoever they sell over there. (Yes, at Taiwan 7-ELEVEN sell foods and they are really good) Anyways, there would be new XBOX 360 discs my cousin bought like WWE12. We’ll have a knockout time playing those, but of course we can’t stay indoors forever so every morning like at 7 or something (A time when the sun isn’t too bright)we’ll grab a basketball and go play for like two hours or something. After that we can buy Slurpee’s at 7-ELEVEN to cool off. But this isn’t the highlight of my holiday, sure I’m going to have fun playing video games with my cousins but there is this one event that is shocking. My bigger cousin (27) is getting married! Now you’ll probably think it’s boring but I love my cousins on my mom side of the family, they are so fun and nice to me. (Excluding the 7-year old one) And I got introduced to the game Batman: Arkham Aslyum which results to my addiction to Batman: Arkham City by the cousin that’s getting married. 5 more days till my brain goes kerplunk… I can handle it! Felarin Soloja is a character that speaks loudly and that is a outspoken person. He works as a journalist and cares a lot for his children because he is proud of them. He isn’t afraid of the government and isn’t afraid to oppose them. 1. Felarin would get captured by the government when his children escape. 2. Felarin would convince the nation about the government and there would be an violent uprising. You ever wondered how red blood cell move throughout the body? Well this is the perfect video for you! Watch the video of how a red blood cell move and what it does to you! Hey guys this is the trailer I created, hope you like it and stuff so enjoy! The book trailer is probably one of the most interesting projects out of the four. You wondering why i say its interesting? Because you actually can experience creating a book trailer, putting texts and adding picture is really enjoyable. We can also find music that goes along with the book and I really had fun doing that. This project made me learn that reading is enjoyable and helps pass the time when you’re bored and don’t know what to do. Doing projects always have a gain, what I gained is the increase of my humanities grade. Chao.